The snow has stopped falling, leaving much of the area under at least an inch of the fluffy stuff, but freezing temperatures overnight will leave some roadways slick with ice. WASHINGTON — The snow has stopped falling, leaving much of the area under at least an inch of the fluffy stuff, but freezing temperatures overnight will leave some roadways slick with ice. Most of the region received between 1 and 2 inches of snow. As cars tread over the roadways, that snow will warm up, only to refreeze as temperatures remain in the teens and 20s overnight. Some school systems offered early releases and canceled evening activities due to both the snow and the still-extreme cold, which is not expected to let up until early Saturday afternoon. Then some much warmer days are ahead. With cold air and freezing surface temperatures, any roads that were left untreated will be slick and dangerous during the evening commute. Snow coated most roads in the area by the early afternoon Friday, and the accumulation is expected to keep roads damp and subject to refreezing until late Saturday morning. Patches of fog will also make visibility difficult early Saturday morning. Local transportation authorities reminded drivers to take it easy on their way home for the weekend. “Sidewalks and streets are pretty snow-covered. If you’re going to be on a side road, you’re probably going to end up sliding around a little bit,” WTOP’s Nick Iannelli reported from Silver Spring. Stinneford reminded listeners that the extreme cold will last through the early afternoon on Saturday, but a major warm-up is ahead. High temperatures could reach 60 by Tuesday. 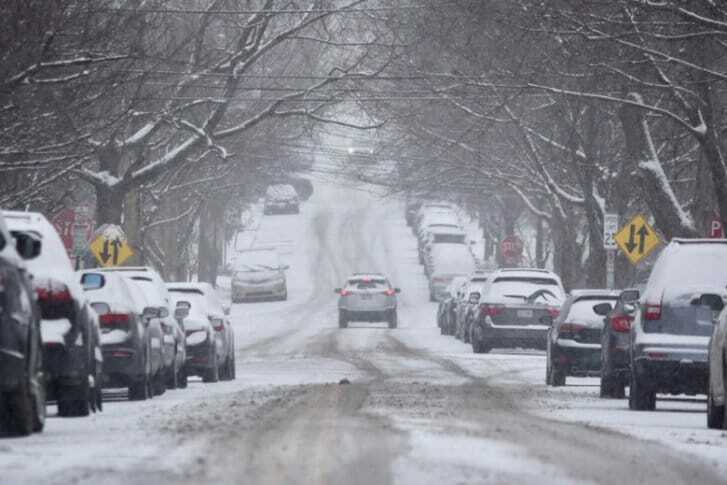 However, he said, on Friday night, beware of a re-freeze, as roads that may have turned slushy due to treatment and passing traffic could turn hazardous as temperatures drop into the teens. The snow started early Friday, as Reagan National Airport started reporting light snow at around 7 a.m. and Martinsburg and Winchester reported light to moderate snow reaching the ground around 7:30 a.m. Snow started moving into western Maryland, and far northwestern Virginia shortly before 5 a.m.
By 5 p.m., most of the snow was out of the District, but snow could remain an issue north toward Baltimore during the evening and toward the eastern part of Maryland. When it’s all over, up to 3 inches of accumulation is possible from Winchester to Martinsburg to Hagerstown and Frederick, Maryland. Clouds will give way to sunshine by Saturday afternoon with highs reaching the low 40s, Stinneford said Friday evening. Even milder air arrives for Sunday with most areas getting reaching into the 50s. Dry weather will continue into Monday with highs in the mid 50s. Monday: Partly sunny and warmer. Highs of 55 to 60. Tuesday: Morning shower, but warming. Highs near 60.